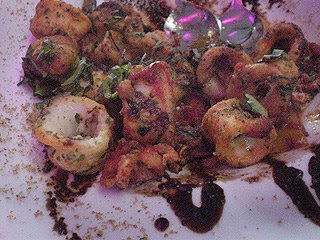 Steve Martorano, of Cafe Martorano, in Las Vegas has no problem getting people to appreciate his South Philly style food. Whether or not they understand his "Don't break my balls" (actually written on the menu) attitude is another thing. I have to admit, even though I'm from South Philly I was a little reluctant to try Cafe Martorano. I had read some pretty negative reviews online and wasn't sure I was ready to deal with that kind of attitude at a restaurant. Especially one that was going to cost me a pretty penny. So when we decided to go to Vegas for a long weekend; and my mother suggested checking it out I reluctantly made the reservations. Now I can honestly say I'm glad we went. The staff was nothing but nice. Maybe even over the top nice. Once the hostess found out we were from South Philly she made a point of hugging us as we left (a South Philly thing for sure). 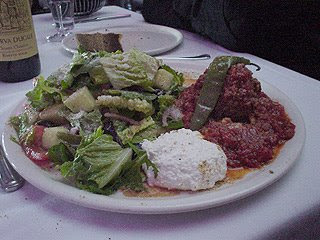 Portions were huge; the food was delicious; and the whole experience was all very traditional South Philly style Italian. We ate salad served in the same plate with our meatballs. The gravy (known to most as tomato sauce) mixing with the oil and of course red wine vinegar (something my family does all the time). The penne in gravy, cooked just to al dente, included chunks of pork. Just like we ate every Sunday at my mom's. 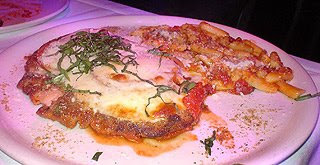 We had chicken cutlet with fresh tomato slices and melted mozzarella; with a side of cavatelli. Another family favorite. 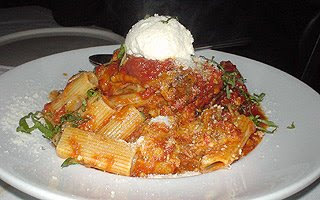 So if you're looking for a true South Philly style Italian experience and can't make it to Philly head on over to Cafe Martorano's in Vegas for authentic food with attitude. The next time I'm in Vegas, I'll be sure to look this place up, that food lokks damm good! As yo may have noticed, even though I'm not from South Philly (although a big fan of Jim's on South St), I tend to like my food with a little attitude too- even if I have to supply it myself! !